During his earthly life Jesus made healing a central part of his ministry. He cured people of all kinds of diseases, even death itself, sometimes by simply touching a person and speaking a word. When Jesus sent the disciples out into the world (Mark 6:7) they were given three tasks: preaching, teaching and healing. In the 2,000 years since then, Christians have been closely involved with health, healing and wholeness. There is an impressive tradition of Christian engagement in health ministry upon which to establish a vision for the 21st century. Many people have accepted the secularist approach which prioritises science over faith particularly in matters of medicine and health. The integrated model to preaching, teaching and healing that Jesus practiced is viewed with suspicion in 21st-century medical practice. However the Church, and The Salvation Army in particular must resist being squeezed out by the forces of health specialisation and commercialism. Health and healing is much more than the business of doctors, nurses and health professionals and ever increasing technology. The health ministry offers 21st-century Salvationists an opportunity to witness to ‘wholeness’ – the healing ministry offers a visible, practical and necessary witness to our faith to a world scrambling around for solutions to ever-spiralling health care costs. 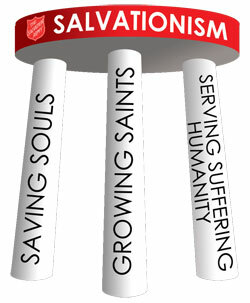 The Salvation Army is a faith-based organisation and not merely a non-government organisation (NGO). Therefore theology determines the foundations of Salvationist mission. Christian conviction about the importance of health, healing and wholeness comes from the doctrines and beliefs about who God is and what he wants his people to do. General John Gowans (now retired) helpfully summarised The Salvation Army’s mission in a three point statement: save souls, grow saints and serve suffering humanity. This statement of salvation, sanctification and service is not a menu of three options from which we can choose – rather it is a statement of the essential components for integrated Salvation Army mission. People engaging in only one aspect of mission are missing out and fragmenting the three-fold purpose of The Salvation Army. No Salvation Army programme can remain faithful to God’s purposes if it relies on one or two legs of the stool – all three are required for a stable, sustainable, God-honouring expression of Salvationism. When one leg is weak, the whole stool is unstable. If two legs are missing, the stool will topple over! The word ‘integrating’ is a reminder that the task will never be fully complete – it is an ongoing process. When Christians get past the idea that only trained health professionals can be involved in health services, it is possible to see the many opportunities for ‘ordinary’ people – and particularly people of faith – to respond to God’s call to be involved in the work of healing the world. This work of healing the world is a key task for Christians working together in corps and churches around the world. Local churches (and particularly Salvation Army corps) are well placed to bring hope to the health needs of the poorest people. There is clear evidence showing that the most effective health care (particularly for the poorest people suffering from preventable diseases) is done in the home. In many cultures this is undertaken by untrained women who are expected to do most of the caring – but often they are unaware of basic prevention, treatment and care information. The Church can play an important role in improving the knowledge, attitudes and practices of women in the poorest communities. It is also important for men to understand their responsibilities and opportunities. The best way for The Salvation Army to improve the health of the poorest members of the community is through the ministry of local corps members because they live in the community – they are not merely employees of short-term projects. Hope, change and a healthier life will not be achieved in corps, churches and communities until the lives of individual people are transformed. Christians believe this best happens through an encounter with God and this is the basis for the impact that faith-based organisations have around the world. Even people with a more humanistic worldview can see the tremendous capacity, resilience and power that is unleashed when people of faith work together. However, this is not easy to achieve. Institutions can easily become disengaged from the communities they seek to serve. This can happen in Salvation Army hospitals, clinics, hostels and even corps. It is easy to become comfortable with a ‘provider’ mindset which says, ‘You come to us and we will help you’. People then quickly become comfortable within their own walls and just wait for the community to come to them. This ‘provider’ mindset has too often characterised the way concerned Christians try to serve communities. It does not allow people to help themselves; it does not allow people to solve their own problems and it increases levels of dependency. It is an unsustainable, unfaithful approach – but it feels less risky and therefore many people and programmes slip into this way of working. In contrast a ‘covenant partner’ mindset encourages everyone to build relationships of equality; it moves out of the buildings and into the communities to meet people where they are and does not wait for them to come to us. This approach is much more likely to have long term sustainable success. One of the key tensions for a large, hierarchical organisation is the ‘top-down’ versus ‘bottom-up’ debate. In recent decades there has been a reaction against authoritarian leadership from the top of any organisation and a strong belief that people closest to the problems in the community should be enabled to make decisions. Professor Taylor’s concept can be adapted to reveal the important role that faith-based organisations like The Salvation Army can play in this process. 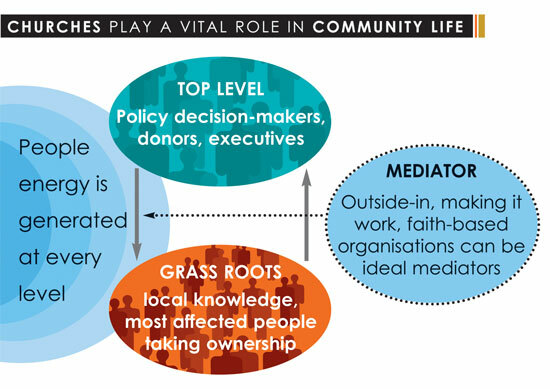 It highlights the vital impact and role that Faith Based Organisation – with strong connections and relationships in the community – can play as mediators. When these creative relationships flourish, a dynamic ‘people energy’ is generated at every level. These ways of respectful working together are essential if sustainable health improvements are to be achieved by the poorest communities. The Salvation Army will seek to be a significant participant in the delivery of faith-based, integrated, high quality primary health care as close to the family as possible, giving priority to poor and marginalised members of society. The Salvation Army will offer education programmes that equip health workers with appropriate skills and experience as well as developing commitment to holistic Christian health ministry. This list of health issues may seem rather unconnected but, in fact, they have a common thread. These issues all respond well to community-based health interventions and benefit from long-term support from health care providers. In other words, quality primary heath care as close to the family as possible can make a huge difference in the lives of people experiencing these challenges. Primary Health Care (PHC) requires bringing quality health programmes as close to the family as possible. The Salvation Army is well placed to do this by placing corps at the pivotal point of Salvation Army health services. With more than 15,000 corps around the world, The Salvation Army has a significant capacity to be a focus for a ministry of healing and education in thousands of communities across the world. Such an emphasis will help more people to discover their wholeness in Christ and in their community – as against a merely individualistic understanding of healing of the body. 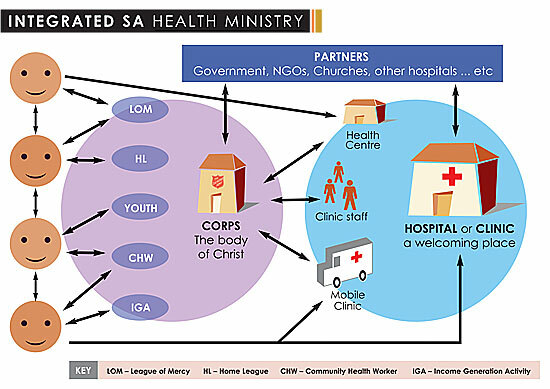 The following diagram illustrates how different Salvation Army programmes can be integrated into a continuous chain of care from home to hospital and back. Salvation Army health ministry often occurs in deeply dysfunctional societies. Societies ravaged by poverty, war, disease and community breakdown are chaotic places to work. Such communities need an integrated health system that links people in their homes with reliable, sustainable health services. It is very difficult to do this without an institutional base. A clinic or small hospital is an essential anchor in these chaotic communities – a place of stability from which the essential community-based health and development work can be sustained and supported. The role of the institution in Salvation Army ministry is not limited to hospitals and clinics. Across the world The Salvation Army has significant institutional presence. In addition to 20 general hospitals, 45 maternity hospitals and 123 health centres/clinics, The Salvation Army, working in 116 countries, has many other ‘institutional’ programmes. For example, 440 hostels for homeless people, 228 children’s homes, 116 homes for elderly people, 60 homes for disabled people, 12 homes for blind people, 57 remand and probation homes, 41 homes for street children, 41 mother and baby homes, 77 care homes for vulnerable people, 104 centres for people seeking refuge and 204 residential programmes for people with addiction dependency. The Salvation Army has 2,286 education institutions which offer similar opportunities for ministry. However, we must admit that it is very difficult to envision a future for many large, multi-speciality general Salvation Army hospitals. A few may survive with significant government funding but we cannot see this being a sustainable approach for most territories. However, we do believe that a corps-centred health ministry supported by small hospitals and clinics has a great potential for 21st century faithful ministry.